A selfie taken by a black macaque monkey and an entire aboriginal language were asked to be removed from Wikipedia by people who claimed to have the copyrights to them, the Wikimedia Foundation said in its first transparency report. Wikimedia, which operates Wikipedia, published a report Wednesday detailing two years of alteration and takedown requests as well as requests for user data it received. Of the 304 general content removal requests, none were granted, Wikimedia said in a blog post. And while the amount of copyright takedown requests was notably low, the requests that were made might raise some eyebrows. One of them was made in January by a photographer who left his camera unattended in a national park in North Sulawesi, Indonesia. 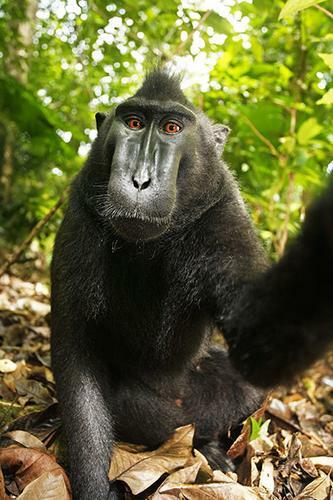 A female crested black macaque monkey managed to get a hold of the camera and took a series of pictures, including some self-portraits. The pictures were then featured in an online newspaper article and eventually posted to Wikimedia Commons, a database containing freely usable media files, Wikimedia said. "We received a take-down request from the photographer, claiming that he owned the copyright to the photographs. We didn't agree, so we denied the request," the organization said. The photos (1, 2) are still part of the Commons database where the author is listed as "the monkey on the photo" and the permission field says "non-humans cannot own copyrights." Another copyright takedown request, stemming from July 2012, involved a Tasmanian aboriginal language center that demanded the removal of the English Wikipedia article on 'palawa kani', a project to create a generic language resembling the extinct languages once spoken by the Aboriginal Tasmanians. The language center claimed copyright over the entirety of the language, Wikimedia said. The organization refused to take the article down "because copyright law simply cannot be used to stop people from using an entire language or to prevent general discussion about the language," it said. "Such a broad claim would have chilled free speech and negatively impacted research, education, and public discourse -- activities that Wikimedia serves to promote," it added. In March 2013, Wikimedia also defended Wikipedia users involved in a Wikipedia article about a French military base. A French intelligence agency summoned a Wikipedia user to its offices, threatening him with severe criminal penalties if he did not use his administrative rights to delete information that the agency deemed classified, Wikimedia said. "The supposedly classified information was actually publicly available because the military had provided interviews and a tour of the base to local reporters," said Wikimedia. The article is still online. Wikimedia also detailed the number of requests for user data it received and said only 14 percent of a total of 56 requests were granted. Some requests were not up to Wikimedia's standards, meaning they were "overly broad, unclear, or irrelevant," according to the report. Often, Wikimedia simply did not have any information to give, it said, adding that it collects little nonpublic user information and retains that information for a short amount of time. The types of user data requests included informal non-government requests, informal government requests, civil subpoenas and criminal subpoenas. The most requests were made in the U.S., where 8 of the 21 requests were granted. All the requests in other countries were denied.